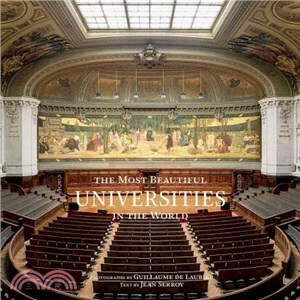 The Most Beautiful Universities in the World invites readers to discover more than 20 hallowed halls of higher learning, from the University of Bologna—the Western world’s first university, founded in 1088—to the Sorbonne in France to Cambridge University in England to Yale University in the United States and many other architecturally significant universities in between. Following his acclaimed books on the world’s most beautiful libraries and opera houses, photographer Guillaume de Laubier now turns his lens toward a new aspect of world heritage. Sumptuous photographs showcase amphitheaters, libraries, reception halls, and hidden gardens, while the text describes the history of each campus, its architecture, research disciplines, and reference collections. Guillaume de Laubier is a photographer who specializes in interior design, architecture, and lifestyle. He has published several books, includingThe Most Beautiful Libraries in the World, The Most Beautiful Opera Houses in the World, andDressing the Home. Jean Serroy is a French literature and theater specialist and a university teacher.